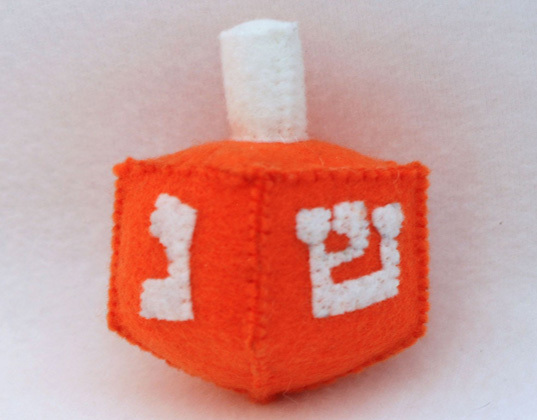 The first candle for Hanukkah will be lit tonight and with the Festival of Lights comes everyone’s favorite game of the season — dreidel. This handmade Eco Felt Dreidel, Gelt and Bag set from Mama Made is the perfect gift to start the celebration. Each little dreidel set comes with an eco felt (made from recycled soda and water bottles) dreidel, 10 “gold” coins (gelt) and a bright and fun carrying case. For that extra special touch, some of the gold coins show the “chocolate” inside. This will be a treasured Hanukkah toy that your child will enjoy year after year. OMG, what an awesome find!!! The first candle for Hanukkah will be lit tonight and with the Festival of Lights comes everyone's favorite game of the season -- dreidel. This handmade Eco Felt Dreidel, Gelt and Bag set from Mama Made is the perfect gift to start the�celebration. Each little dreidel set comes with an eco felt�(made from recycled soda and water bottles)�dreidel, 10 "gold" coins (gelt) and a bright and fun carrying case.� For that extra special touch, some of the gold coins show the "chocolate" inside. This will be a treasured Hanukkah toy that your child will enjoy year after year.